near Arenal Volcano in Costa Rica! 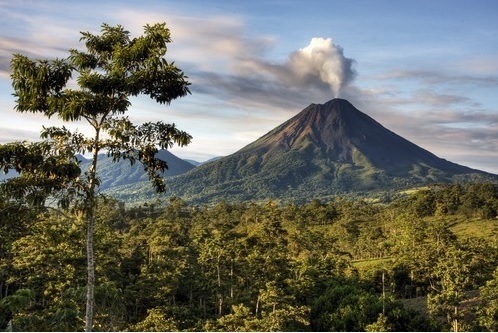 Wake up watching the sun light up the Arenal Volcano from your comfortable bed. Watch toucans from your private porch while enjoying delicious Costa Rican coffee. Collect eggs, milk a cow, groom a horse on our working farm. Feel welcomed and enjoy farm to table fresh food. Immerse your family in a cultural tourism experience. Experience the best horseback riding in Costa Rica at Leaves and Lizards. Be thrilled by the best zip-lines, white water rafting in the La Fortuna area. Enjoy a relaxing massage on your honeymoon or after an exciting day of Leaves and Lizards activities. … then Leaves & Lizards is the place for you! 2 Queen Beds. Inside and Outside Showers. 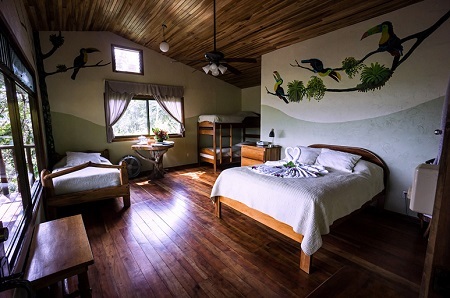 Comfortable, well equipped cabins, perched on hills, offer a tree house feeling and have spectacular, panoramic views of the Arenal Volcano and surrounding mountains. All lodging options have a similar view of impressive Arenal. In order to better enjoy the sounds of nature; lodging options do not have phones, television or air conditioning. They are situated to catch the breeze and have floor and ceiling fans. They are a 5 -8 minute walk from the Lava Lizard Restaurant where guests are welcome to use the phone for local calls and free high speed WiFi. Stay a minimum of 3 Nights and up to 14 Nights as desired and based on availability.